Chrichton's World: Review SPL 2: A Time for Consequences a.k.a. Kill Zone (2015): What a surprise! Review SPL 2: A Time for Consequences a.k.a. Kill Zone (2015): What a surprise! SPL 2 Is what you call a pleasant surprise. I had very little expectations of this being any good. Since for me it was Donnie Yen who made it stand out and mostly because I had lost faith in Tony Jaa a little. Rest assured he has redeemed himself and how. 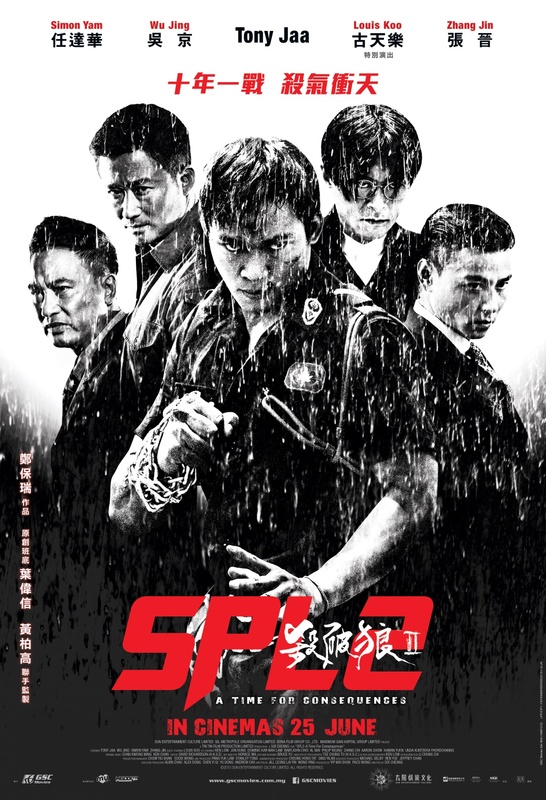 While this is advertised as a direct sequel to SPL with Donnie Yen there is no real connection to speak of. Only Simon Yam and Wu Jing return but play different characters. It's a little puzzling why they those this to be a sequel instead of a standalone film then again this way it did spark some interest from me and everyone else who liked the original. It was nice to see Simon Yam play a decent character for once. And as always he proves he is among the best when it comes to acting. Actually so were Wu Jing and Tony Jaa. Well, I already knew Wu Jing is a capable actor but Tony Jaa I still was not sure off. I guess director Pou-Soi Cheang had more faith in him than previous ones. Which helps to make things intense and compelling. One thing you have to be aware of is that this film is more than your typical martial arts / crime story. SPL 2 is incredibly dark and gritty. Not the kind solely for shock effect. It's the type that truly gets to you since you are rooting for the main characters and you don't want to see them get hurt. There are many times when you just can't stay positive any more and get swallowed by despair and hopelesness. Yes it is that heartwrenching. But don't let this get you down to much because Wu Jing and Tony Jaa refuse to be beat down without fighting the good fight. The action is spectacular only it takes a while for the real action to take place. But do expect the martial artists to get some help from wireworks. It does make sense why it's used. If I have it correct they wanted to emphasize the skills of two villains / henchmen in particular. And they do make an impression so it's almost like a necessary evil. I had no idea I was going to enjoy this film as much as I did. But just shows you that often it pays off to keep an open mind about things. SPL 2 is a good action film that will suprise you in many ways and has a narrative that is compelling and intense. So what are you waiting for? Go watch this already.